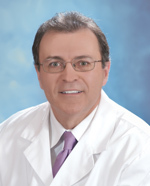 Home / About Us / Our Providers / A. David Tahernia, M.D. What Makes Spinal Surgery Successful? John White, 70, is an active guy. 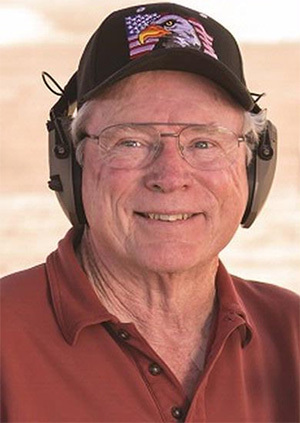 Retired from the military, police and federal court, and still running his own private investigator business, it’s not in his nature to be sedentary. But worsening back and leg pain had seriously curtailed his ability to maintain an active lifestyle. “I could get up and walk around, but I was limited in how far I could walk,” the Palm Desert resident relates. “I had to cut my exercise routine by about 80 percent.” The culprit was spinal stenosis, a narrowing of the open spaces within the spine, which can put pressure on the spinal cord and the nerves that travel through the spine to the arms and legs. White also had spondylolisthesis (instability of the spine), caused when one vertebra slips forward on another, also narrowing the spinal canal. Under the care of Board Certified Orthopedic Surgeon David Tahernia, MD, at Eisenhower Desert Orthopedic Center, White first tried conservative measures to manage his pain. "I took pain pills, I'd lie down in the middle of the day to rest my back, and I was icing it several times a day," he relates. “I also tried an epidural injection, but it only gave me relief for a few days. By age 50, most Americans have walked 75,000 miles — translating to an immense amount of wear and tear on one of the most complex and vital areas of the entire body — the foot and ankle. Containing 25 percent of our body’s total bones, our feet are comprised of 28 bones per foot, 33 joints, and more than 100 muscles, tendons and ligaments. Given the enormous responsibility of these often-ignored work-horses (our feet), it is no wonder that the estimated number of foot and ankle-related injuries in the United States is 25,000 — every day. 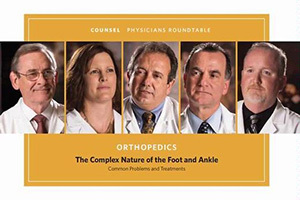 Gathering to speak about common foot and ankle concerns in this Physicians Roundtable are Board Certified Orthopedic Surgeons David Friscia, MD, and Julie Johnson, MD, Board Certified Podiatrist Michael Seiberg, DPM, and William Hinds, PA. Philip Shaver, MD, Board Certified in Cardiology, moderated the panel.